If you are looking for budget laptops which give you excellent performance, without burning a hole in your pocket, then you have come to the right place. Firstly, a proper laptop choice would be to find balance between multiple characteristics and specifications like a power packed processor, a robust graphics card with a not-so-small display screen. Or you can go for a high storage capacity enabled laptop which comes with an above average battery backup. And the good news is that today, with different manufacturers vying for the customer’s attention, prices have become quite moderate for a number of commendable models too! Lenovo is one of the bigger brands who have recently forayed into the budget laptop category. And with budget, the limits are set as low as ever. Their answer to the chromebook and other budget windows laptops is the Ideapad 100s, their latest sub $200 offering. It does pack decent specs and an Intel Atom processor, and offers some good value for money. Ideapad 100s runs on a 33GHz Intel Atom Z3735F processor, specifically designed for mobility devices. It is supported by 2 GB DDR3 RAM, and a 32 GB flash memory for storage. Storage can be expanded using SD card up to 128 GB. It gets an 11.6” screen with 1366 x 768 resolution. It has a front facing camera too. This laptop comes with Windows 10 preinstalled, along with free office subscription. This laptop features good design and build quality for this price range. It is 0.7” thick and weighs a mere 2.2 pounds. The outer surface is finger resistant and feels good. 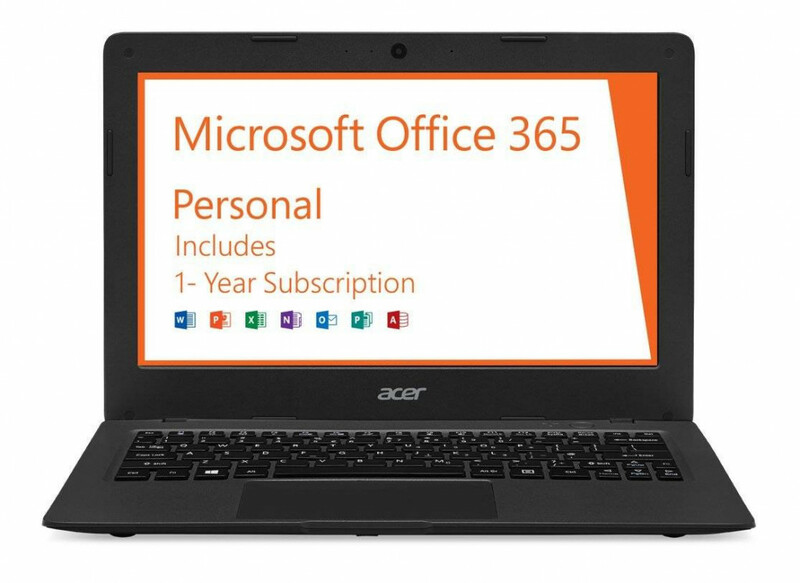 With an Atom processor the performance is good and the laptop zips through everyday tasks like web browsing, watching videos or editing documents. It can also play casual games from windows store. The battery life on this device is amazing and can easily last upwards of 11 hours. The keyboard is well designed and it is quite fun typing on this keyboard. The track pad is the weakest point on the Ideapad 100s. With the buttons separated from the touchpad, it loses valuable space. And the trackpad does not support multi touch gestures, which can be quite a pain especially when browsing web pages. The screen is just decent and the brightness can be low when using in well-lit areas. Acer is one of the oldest players in the laptop industry, and no doubt that they have also ventured into the new budget laptop category. Their effort comes in the form of Aspire One Cloudbook. It is a nice little laptop with a present price tag of $150, which makes it very lucrative for anyone looking to get a portable laptop to just get the job done. It runs on an Intel Celeron N3050 CPU which clocks in a 1.6 GHz. The processor is accompanied with 2 GB of DDR3 RAM and 32 GB of internal flash memory. There is a provision to use SD cards up to 128 GB to expand memory. The screen is an 11.6” unit with a resolution of 1366 x 768. Windows 10 is pre-installed on this device, and it also gets 1 year subscription of Office 365. Aspire Cloudbook has very minimalistic and subtle design on the exterior which is mostly covered with black plastic. The build quality is very solid though, and there is no squeaking or bending of any sorts. The sound quality from the speakers is quite good. The trackpad supports multi touch gestures. It has a decent battery life of 8 hours. The Celeron processor does a decent job, but cannot match performance of the Atom processor. It slows down with even 3-4 application open at the same time. The keys in the keyboard are placed too close together for fast typing, and there is a good chance you’ll end up pressing one of the keys around the one you intend to. Hewlett Packard is one of the household names across the world when it comes to personal computers. 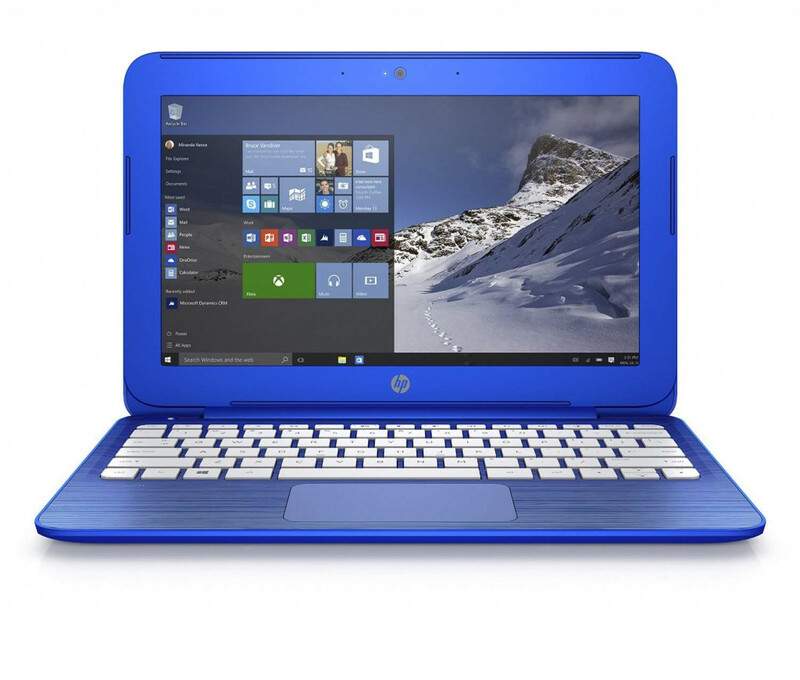 Here HP brings its Stream 11 Laptop to make a name for itself in the budget laptop category. It is a cloud device with minimal specifications, and designed to offer great value for money. The processor is an Intel Celeron N3050 CPU and clocks in at 1.6 GHz. There is 2 GB of DDR3 RAM and 32 GB of internal flash memory. Memory can be expanded using SD card up to 128 GB. The display unit is 11.6” diagonally and runs a resolution of 1366 x 768 pixels. The device comes with windows 10 pre-installed and 1 year subscription to Microsoft Office 365. The Stream 11 has a very distinctive and attractive design for this price range and looks good. The bright colours add a youthful touch, and the nice design is accompanied by solidly built plastics and quality of build. The battery life on this device is great and will clock in excess of 8 hours. The trackpad supports multi touch and gestures like two finger scroll which make browsing web pages a breeze. The keyboard is nice for this range and offers a good typing experience. The overall performance of the device is nothing to rave about, and it is sluggish at times. Web pages open fine, but the experience starts to lag with a dozen tabs open at the same time. The trackpad is a little finicky and sometimes registers touches a little late. The screen has very less brightness and can be pain to read in well-lit conditions. Dell is among the most trusted brands in the world when it comes to personal computers. 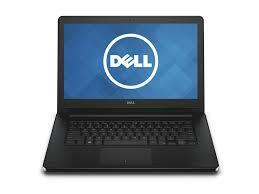 Famed for its innovative self-configured PC’s, Dell has entered the budget laptop segment with the Inspiron 14”. The device here has its price cut, as it is a refurbished model, which makes it even a better deal for money. It employs an Intel Celeron N2840 CPU and clocks in at 2.16 GHz. It has 2 GB of DDR3 RAM and 32 GB of internal flash memory, which can be expanded using SD card up to 128 GB. It has a screen of size 14” and runs at a resolution of 1366 x 768 pixels. It comes with Windows 10 Pre-installed, and offers free One drive cloud storage as well. The Dell Inspiron 14” is a large laptop with a very subtle and understated design. The plastic quality is decent, but the build quality is good and the laptop feels solid overall. The performance from the Celeron processor at slightly higher clock speed is the standout and the devices zips through everyday tasks and can take slight multi-tasking as well. The keyboard has well-spaced out with large keys, and typing is a good experience on this keyboard. The device is heavy compared to others and weighs 4.4 pounds. The display is below average, mostly because of the low resolution and low pixel density. Web pages with a lot of text can be difficult to read at times. Battery life is less at 6 hours, compared to other laptops in the same price range. Samsung is a Korean technology giant and is one of the most known and respected brands across the world. Their Chromebook 3 is an example of their foray into budget laptops, especially powered by the light and cloud based chrome OS. The configuration is similar to any other chromebook in the market, but Samsung is known to tune its hardware to give a very good experience. 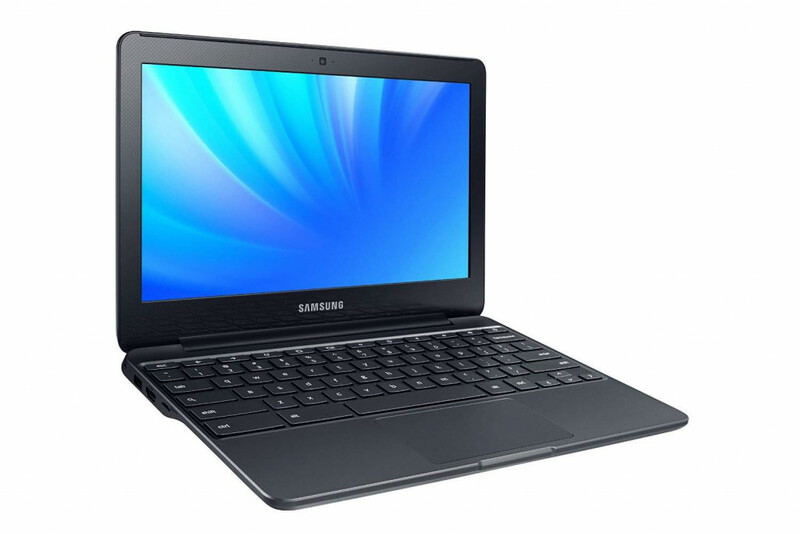 No list of good laptops under 200 dollars is complete without a Samsung Chromebook. The processor is accompanied with 2 GB of DDR3 RAM and 16 GB of internal flash memory. There is a provision to use SD cards up to 128 GB to expand memory. It runs the latest update of Google’s Chrome OS. The design of this laptop is amazing for the price range, and it may throw off some people as a more expensive laptop. It has very compact dimensions and weighs in at just 2.2 pounds too. The build quality is good and the plastic feels smooth and solid. Performance of this Chromebook is very good, and is completely lag free. Be it opening multiple tabs in Chrome or editing a document, everything works fine. The keyboard has large keys with nice feedback, and it is nice to type on. It has a great battery life of over 11 hours. The Chrome OS needs a constant internet connection to make the best use of it. Even then it cannot match the diverse array of applications available on the Windows platform. 16 GB of internal memory is pretty less and a SD card becomes must. Lenovo is a Chinese giant and has been present in the technology industry for quite some while now. Their Thinkpad series is a trusted range of rugged business laptops, and the Thinkpad X130e is brought to you at this amazing price as a refurbished model. 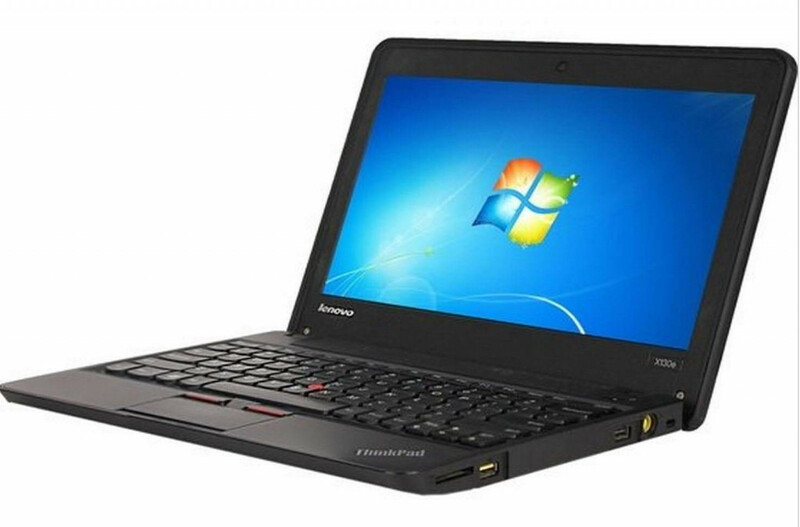 This certainly offers great value for money as Thinkpads adhere to the highest set of standards. The processor is an AMD Dual Core E-series processor running at 1.3 GHz. There is 4 GB of DDR3 RAM and 320 GB of internal storage as a SATA HDD. Memory can be expanded using SD card up to 128 GB. The device comes with windows 8.1 pre-installed. The ThinkPad is built like a tank and you can literally throw it around with a lot of confidence. The looks are dated and boring, but this laptop defines function over form in the bluntest manner possible. The performance form the laptop is quite good for the price range, and the 4 GB of RAM certainly helps in multi-tasking. The device doesn’t slow down or lag even with multiple web pages, documents or videos running at the same time. The screen has a nice matte finish and helps usage in bright areas. The keyboard is good and offers typical Thinkpad experience. There is a lot of space for storage with the 320 GB HDD. It is bulky and heavy compared to other laptops in this price range. It is 1.4” thick and weighs 4 pounds. The trackpad is a little buggy and does not catch faint touches every time. Asus is one of the world’s oldest motherboard manufacturers, and a company which surely knows its way around modern and complex hardware. 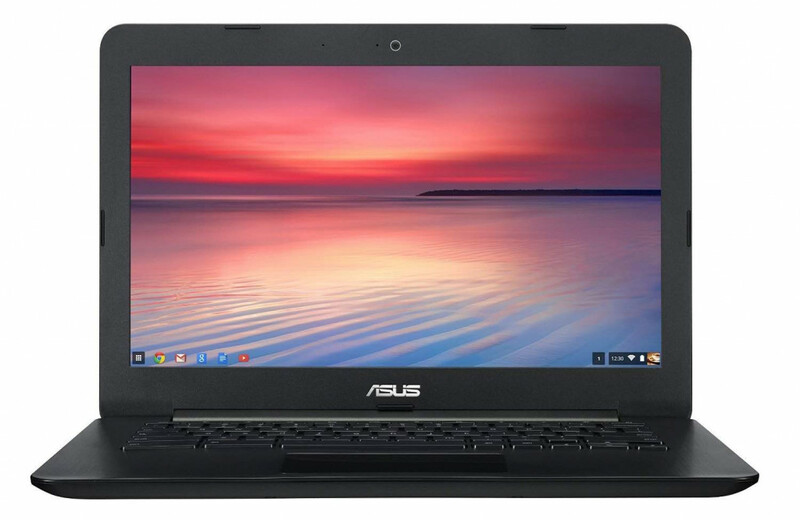 Their laptops are present in all segments of the market, and here we have their latest entry in the budget Chromebook category - C300MA. It has 2 GB of DDR3 RAM and 16 GB of internal flash memory, which can be expanded using SD card up to 128 GB. It has a screen of size 13.3” and runs at a resolution of 1366 x 768 pixels. It runs on Google’s cloud based Chromebook OS. The screen size of 13.3” on this device is very apt for the Chromebook and delivers a great experience of viewing web pages, editing documents or watching videos. The screen itself is bright and offers good colours. The performance is slick and smooth throughout, thanks primarily to the light weight Chrome OS. Multiple apps open quickly and multi-tasking is several web pages open is also good. The keyboard is fairly large and the keys are well spread out. This gives a very good typing experience. The trackpad is also large, and can be used without running off the boundary. Battery life is great on this device, and it clocks around 11 hours of usage before dying. Pixel density is a little low and text intensive web pages can be slightly difficult to read. The build quality is decent at best, with the exterior plastic feeling cheap. Chrome OS still not as diverse as Windows 10. Needs constant internet connection. 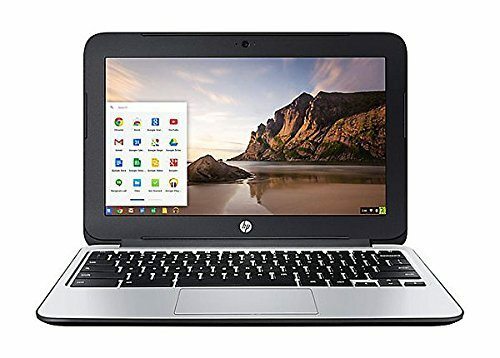 Along with a great range of budget laptops running on the Windows operating system, HP has also ventured into creating Chromebooks to woo the minimal requirements of a student or an easy going elder. Their latest effort is the Chromebook 11 G3, and it competes with offerings from Samsung, Asus and other manufacturers. It runs on an Intel Celeron N2840 CPU which clocks in a 2.16 GHz. The processor is accompanied with 4 GB of DDR3 RAM and 16 GB of internal flash memory. SD card up to 128 GB can be used to expand memory. The design of this laptop can draw parallels, but looks good for the most part. The outer surface is made from textured matte plastic which provides it a good grip. Build quality is solid and abides by HP standards. The processor similar to the ones found in other Chromebooks, but the G3 strikes by using 4 GB of RAM. This shows in performance, as it can handle any number of applications simultaneously. Videos play smoothly, multiple tabs open quickly and the whole experience is smooth and jitter free. The keyboard is nice, with an ergonomic dink in the middle of the keys for your fingers. Typing is fast and accurate. The track pad is small and could do with a little more height. The screen is dull and lacks colour. As a result, videos and photos appear a little boring on this laptop. Battery life at 7 hours is less compared to other similar Chromebooks. 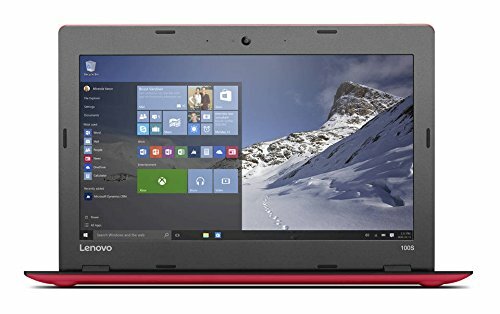 Lenovo has been present in the laptop industry for quite some time now, and have assembled a great line-up of Windows operating system based laptops over the years. Now they have forayed into the Chromebook budget laptop category, aiming the casual student and youth with very basic computing needs. 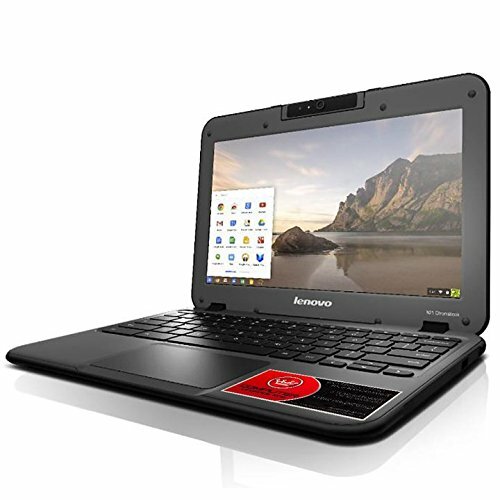 Sitting proudly in this list of top laptops for under 200 dollars, Lenovo N21 Chromebook is one such example. It has 4 GB of DDR3 RAM and 16 GB of internal flash memory, which can be expanded using SD card up to 128 GB. The screen is a 11.6” unit running at a resolution of 1366 x 768 pixels. It comes with latest update of Google’s Chrome OS. The N21 is a nicely made laptop with good build quality, and can survive a drop. The outside is made of textured matte black plastic which offers good grip and prevents the device from getting dirty. Performance is slick and smooth as expected from Chromebooks. The 4 GB of RAM surely helps in additional multi-tasking, and the device does not slow down even with videos and multiple web pages open at the same time. The keyboard on this laptop is spill proof, and works pretty well overall. Also, the keys are peel resistant. The trackpad is nice and large with good touch sensitivity, and is spill proof as well. This Chromebook has other nifty features like a rotatable camera and a pop out handle to carry it like a brief case. Battery life at 9.5 hours is slightly less compared to competition. It is also a little heavy at 2.8 pounds when compared to similar Chromebooks. 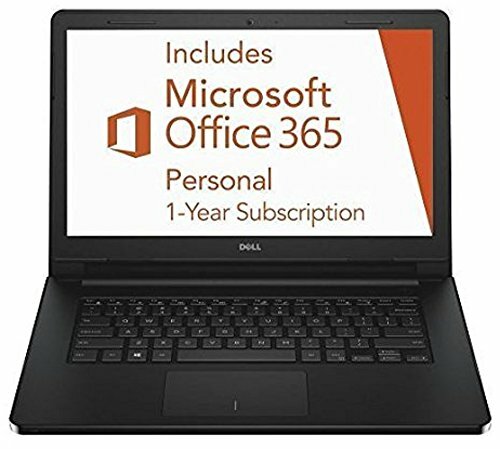 Dell is one of the most experienced and oldest brands in the personal computer segment, and their vast experience guarantees great value for money in each of their products. Their string line up in the budget category is further enhanced by the 2016 Inspiron 14.1” laptop. It is powered by an Intel Celeron N3050 CPU and clocks in at 1.6 GHz. It has a screen of size 14.1” and runs at a resolution of 1366 x 768 pixels. It comes with Windows 10 Pre-installed, and offers free 1 TB of cloud storage along with 1 year of free Microsoft Office 365. The Dell Inspiron 14.1” is a large laptop with a very subtle and understated design. The plastic quality is decent, but the build quality is good and the laptop feels solid overall. The performance from the Celeron processor is decent, and the device zips through everyday tasks and can take slight multi-tasking as well. But loading it together with multiple applications can deter results. The keyboard has well-spaced out and large keys and typing is a good experience on this keyboard. The device is heavy compared to others and weighs 3.9 pounds. Well, here was our list of some great laptops for 200 dollars. Before buying, you can consult this list and conduct some personal research as well. Also tell us which model caught your eye most favourably? And do you think we’ve missed out on something? Let us know if you think there’s a laptop out there which you feel deserves to be on the list.